I haven't gotten my nails done in a very long time, namely because my old haunt closed down. Mr. Monkey had a black-tie work function several weeks ago, so I decided to try a new place nearby. 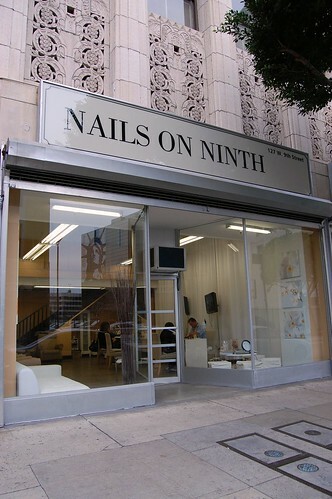 Nails on Ninth (127 9th Street, Los Angeles, 213.627.6245) has been open for a few months now, just a few doors down from our beloved, very delicious Wood Spoon. The salon offers both OPI and essie polishes. Prices are reasonable. A manicure costs $12. A pedicure costs $17. A mani-pedi costs $27. The place is quite clean. There are no gross whirlpool foot baths. Your feet will be soaked in a disposable plastic tub. 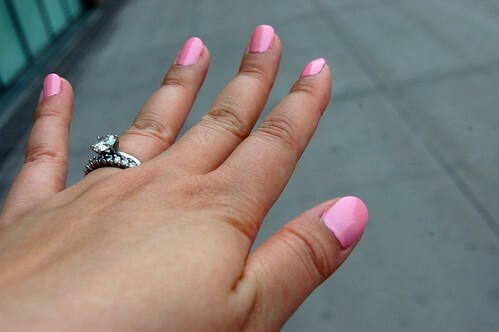 Here's my left hand with OPI's Italian Love Affair. Nice. They did a good job on my toes, too, but my feet are generally ugly, so no feet pics for you. For what it's worth, my toes sported essie's Garnet. Nails on Ninth is open Monday through Friday 10 a.m.-7 p.m., Saturday 11 a.m.-6 p.m., and by appointment on Sunday. I enjoyed my visit and will return. Now for a few bonus pics. 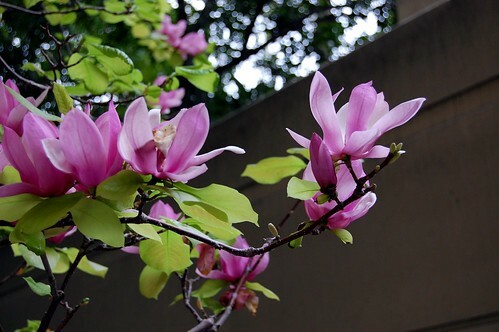 When I got home, I was excited to have my camera with me to capture these blooms. They're long gone now. I heart taking photos. 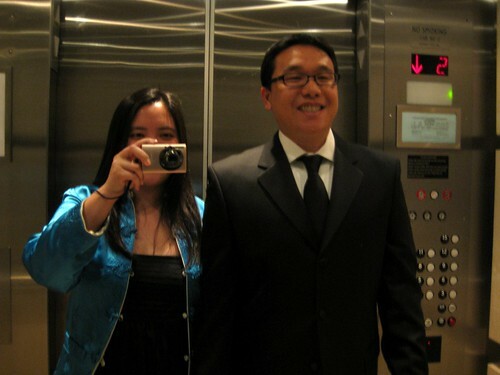 And here's a shot of us in the elevator before we went to Mr. Monkey's event. He's so cute in his tuxedo. cutest babies ever: mr. m in a tuxedo and pink paws. I like the decor at the nail place! Need a full photo of your dress please. Mr. Monkey is looking way swanky. YAY! i'm glad it's decent. gotta go soon. thanks for the review. mr. monkey is way cute in his tux. mr. monkey looks very swanky! that's one thing I don't get about lithuania - the nail place down the street charges $25 for a pedi. but it's only valid M-F from like 10am-2pm. WTF? I looooooove that shade of pink on your nails! 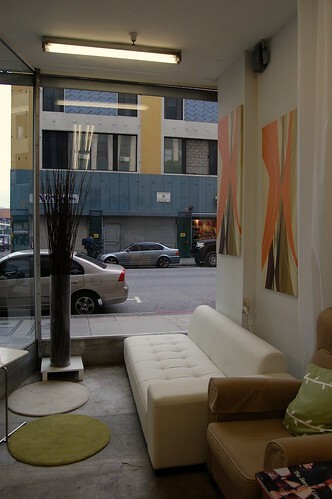 Ooooh nail place downtown! Thanks for the review! And, you guys look so cute! You two are so damn cute together and I agree the Mr looks fetch! I can't believe that salon is that inexpensive. The nail places in south OC are not nearly as sassy and they charge so much more. Wow your nail place is cheap. And I love your blue jacket. $17 for a pedicure! Every place I have gone to charges $25. Color me jealous. My last mani/pedi combo was $37 before tip. now why couldn't this nail place have been open when i lived downtown??? 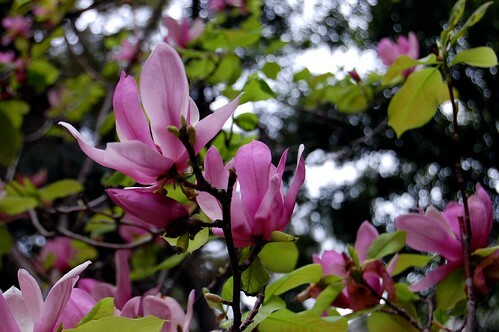 nice shots of the flowers, btw! i love that jacket on you. both you & mr. monkey look great! always good to find a new awesome nail salon. two thumbs up! Wow! I had not idea that Mr Mo got THAT gussied up for his work party! He's fancy! Oooh he does look uber cute in his tuxedo! I'm so jealous that you have a nail place nearby that uses disposable tubs. I live in fear of pedicure disease. whooo! those are some PINK fingers, friend. 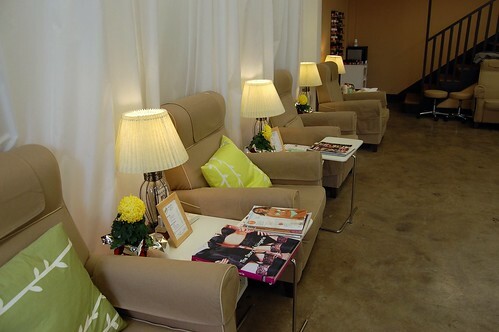 i miss mani/pedis. it's the only thing i like about summer. Mr. Monkey looks so cute in a tux!